UCLA Society of Latino Engineers and Scientists is an organization promoting Latinos in the technical fields of Engineering and Sciences. 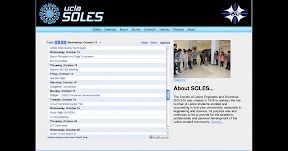 Before redesigning the site for the first time, UCLA SOLES was hosted on a UCLA Engineering server which only allowed static html and images. Moving to a shared hosting platform allowed the use of PHP, access to a database, and a domain name. At the time I developed a calendaring and user management solution, but the familiarity of Google Calendar proved to work better for the SOLES officers. I integrated Google Calendar into the site, and eventually moved the website to use Google App Engine as an experiment to see how responsive the service was, and also how I might be able to save the group money. The site has gone through a lot of changes and now leverages Google App Engine, Google Calendar, and Google Picasa Web to allow changes to a dynamic website.